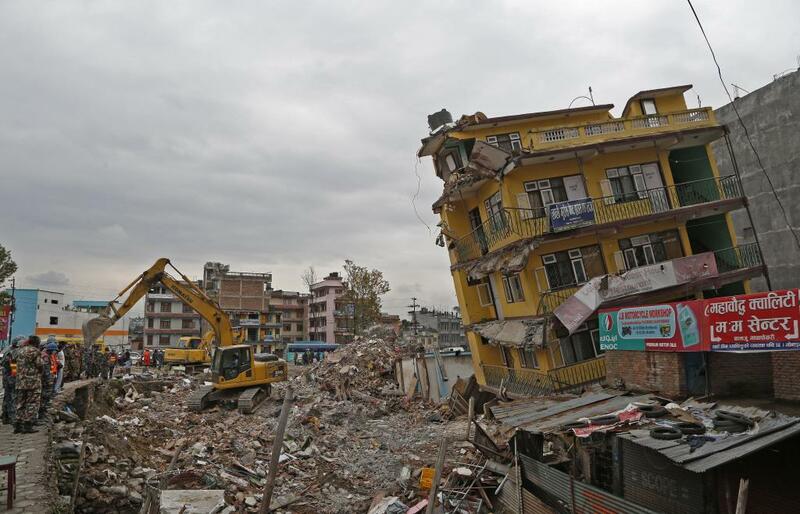 The powerful earthquake that shook Nepal on April 25, 2015 may not have been the end of seismic events in the Himalayan nation, according to a study by Indian researchers who have identified areas of Nepal that are likely to face tremors in the future. The Gorkha Earthquake classified as “violent” on the Mercalli Intensity Scale had given rise to 256 strong and mild aftershocks. An extensive quantitative study on the event carried out by researchers at Raman Centre of Applied and Interdisciplinary Sciences, Kolkata, has identified areas likely to face tremors in the future. The earthquake occurred in the region of the Main Himalayan Thrust Fault. This is one of the regions where the Indian tectonic plate is pushed under the Eurasian tectonic plate. By computing a factor known as the ‘Coulomb Stresschanges’ along the fault, the researchers have obtained important correlations between the location of the main earthquake and its aftershocks. When adjacent tectonic plates are constantly pushing against each other, it causes a huge build-up of stress, known as Coulomb stress, between the plates. If the stress exceeds a certain value that they can no longer withstand, defined by the Coulomb Failure Criterion (CFC), they simply ‘slip’ past each other. Due to this sudden movement, a large amount of built-up energy is released from the location of the ‘slip’ in the form of seismic waves, causing earthquakes. Overall, 218 out of 256 aftershocks occurred in regions which experienced positive value of a factor known as ‘Coulomb stress change’ after the main earthquake. Some locations around the periphery of the fault region, especially the southern end of it, did not experience any aftershocks despite showing positive values of Coulomb stress. These locations are therefore vulnerable and may face earthquakes in the coming years. According to the study, most of the aftershocks occurred in regions experiencing very high values of positive Coulomb stress. Such regions have therefore been classified as the ‘zone of greatest hazard’. Changes in Coulomb stress are a useful input in earthquake prediction models. An earthquake reduces the average value of stress around the region where the ‘slip’ occurs, but it can cause an increase in stress in other regions, due to the geometry and orientation of plates with respect to each other. A positive value of Coulomb stress implies that the failure threshold as given by the CFC has been exceeded. The researchers estimated the Coulomb Stress change at a depth of 10 km, where a major number of aftershocks occurred. In addition, they also performed similar computations for depths of 15 km and 22 km along the fault, where the two strongest aftershocks of magnitudes 7.3 and 6.7 respectively occurred. Article is interesting. But please note that analyse after the event is waste rather than inform the people before its occurrence. a Private Sector Bank entered as BSc Phy graduate (gold medalist) in 1977. Posting my prediction in my website since 2000 (http://earthquake.itgo.com) but due to some constrain, latest updation not taken place. But another expert board at http://earthboppin.net/talkshop/rollem/ carrying my latest prediction messages under the name 'Shan'. Interestingly one of my favorite prediction work was Nepal event in which I have got two different SSD for the two events. Anyway, after seeing this article regarding Nepal event, my mind was way back to those days. Thanking you. R.Shanmugasundaram, Coimbatore South India. IDENTIFICATION OF EARTH QUAKE IN NEPAL:- The IMOS program assists the Government of Nepal to continue enhancing their preparedness efforts and establish coherent approaches in responding and managing the needs of the displaced populations after a large-scale earthquake in remote area and cities in the hilly districts west of Kathmandu.